A big brown bat, one of five species that call NYC home. It turns out Gotham really does have bats plying its skies, plucking unsuspecting prey, and dispatching them into the great unknown. 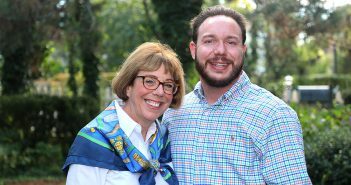 Fordham University and the Wildlife Conservation Society’s Bronx Zoo has conducted the first known study of bats in an urban area on the East Coast. The study provides evidence of both breeding and migration patterns of several species through the area. “Bats in the Bronx: Acoustic Monitoring of Bats in New York City,” published in the journal Urban Naturalist, provides evidence of bat activity in the city and documents the migratory movement of Eastern Red Bats and Silver-Haired Bats through the Bronx in particular. 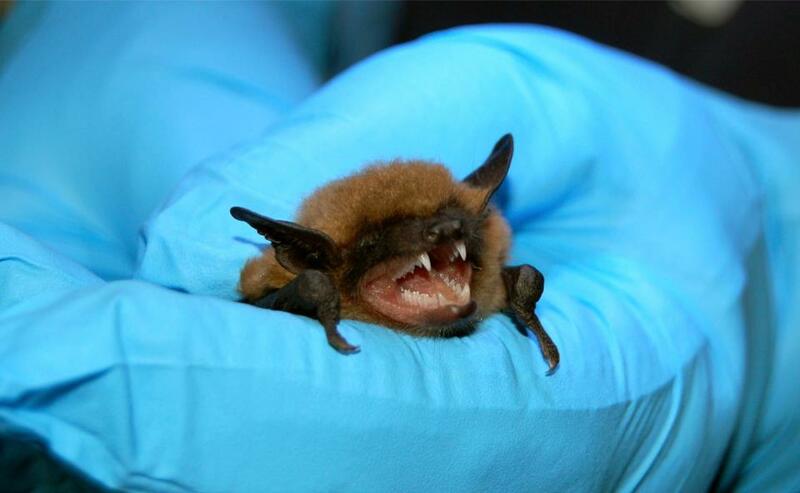 A hoary bat, one of three bats found to be active in NYC during the winter. J. Alan Clark, Ph.D., associate professor of biological sciences and one of the authors of the study, said the biggest surprise was the presence of three bats— Lasiurus borealis (Eastern Red Bat), L. cinereus (Hoary Bat), and Lasionycteris noctivagans (Silver-Haired Bat), during the winter months—a time when it was assumed they’d have migrated away from the area or begun hibernating. To identify bat species and activity levels, the Fordham/WCS team acoustically monitored bats at the Bronx Zoo, Fordham’s Rose Hill campus, the New York Botanical Garden and in the Belmont neighborhood of the Bronx. 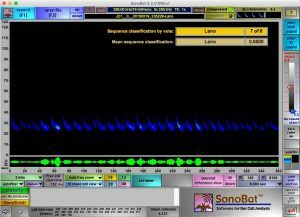 A screenshot from SonoBat. Insectivorous bats have call frequencies that typically range between 20 kHz and 60 kHz which is outside of the frequency of human hearing (20 – 20,000 Hz). To make the calls audible to people they are converted to a lower frequency. Bat activity was recorded using both acoustic-recording devices on building rooftops and with handheld ultrasonic recording units. 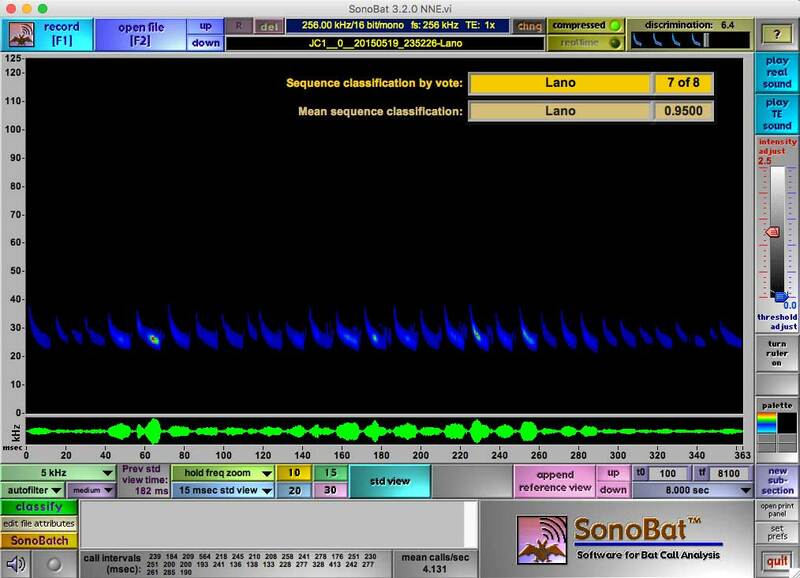 Using a software program called Sonobat, the team was able to identify different species by the echolocation calls that the bats produce in flight in order to navigate and locate their prey. 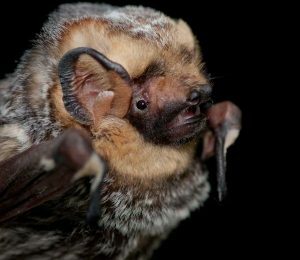 The initial study began in May 2012 and identified the presence of five out of a possible nine species found in New York State: Eptesicus fuscus (Big Brown Bat), Lasiurus borealis (Eastern Red Bat), L. cinereus (Hoary Bat), Lasionycteris noctivagans (Silver-Haired Bat), and Perimyotis subflavus (Tri-Colored Bat). Of the five species detected, the most-represented was Eastern Red Bats. A July increase of its activity, followed by an August peak and sharp decline in September, suggests migratory movement through New York City, as the pattern is consistent with acoustic surveys collected in the Midwest and East Coast. In addition, an increase in Silver-Haired Bat activity occurred in late October—consistent with the timing of coastal migratory movements for this species. The initial study, published in June 2016 and still ongoing at the Bronx Zoo, hopes to monitor year-round bat activity in the park and to identify any changes in patterns of call activity that could occur as a result of environmental factors. Additionally, the study has been expanded to include acoustic bat surveying at the three other WCS parks—Central Park Zoo, Queens Zoo and Prospect Park Zoo—using the same monitoring methods. Initial results from the ongoing surveys reveal that the same five species occur in these three boroughs as well, although the call compositions are represented by different species at each park. Clark has previously documented the positive effects of green roofs on birds in New York; and it’s clear that what is true for fowl is true for bats as well. 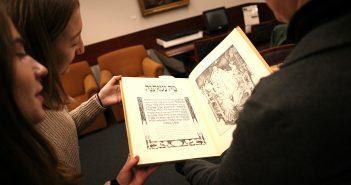 Study co-authors also included Fordham’s Kaitlyn L. Parkins, GSAS ‘15 and Michelle Mathios, FCRH, ‘13,and Colleen McCann, Ph.D., curator of mammals at the Bronx Zoo.